Home > Books > I Can Read with My Eyes Shut! 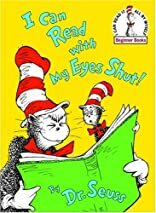 "In Seuss's familiar rhymed couplets and illustrations, the Cat in the Hat shows Young Cat some wonderful stuff about reading with both eyes open." --School Library Journal.